The Reelmaster® 3100-D is powered by a 3-cylinder Kubota® diesel, and is equipped with manually adjustable variable reel speed and on-board backlapping. With available 5, 8, and 11 blade DPA Cutting Units, the Reelmaster® 3100-D will provide a precision cut for a wide range of applications. 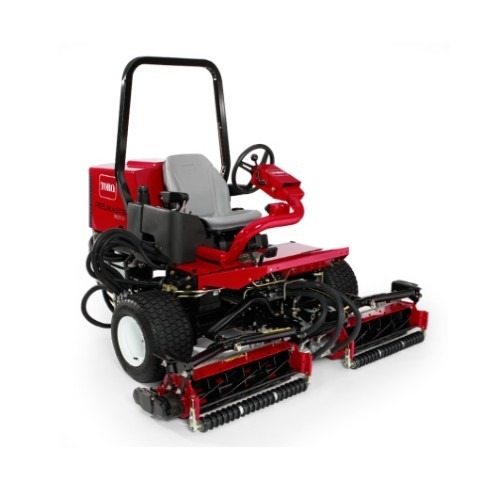 The Reelmaster® 3100-D is available in a 72` or 85` (183 cm or 216 cm) width of cut. With a choice of 5, 8, and 11 blade reels and adjustable reel speed control, this mower can be configured to meet all mowing applications. The patented Series/Parallel 3-wheel drive system provides power to at least two wheels at all times. The result is impressive traction in hilly and wet conditions, and minimal wheel slip so it’s gentle on the turf.